Ohio University astronomers have discovered the largest disk of hot, X-ray emitting gas ever observed in the universe: At 90,000 light years in diameter, it's about 100,000 times the size of any comparable object. The disk, spinning through a distant galaxy, is more than just an interstellar oddity, the researchers say. The object could offer new information about the way certain galaxies form and evolve. About 20 percent of all galaxies are elliptical, the largest of the three types of galaxies in the universe. They differ from spiral galaxies like the Milky Way, as they lack new stars and spiral "arms." Scientists once believed that elliptical galaxies were ancient, simple systems that contained only old stars and formed in the early days of the universe. But new research suggests elliptical galaxies are more complex and dynamic. "It used to be thought that galaxies form and then sit there and age quietly over time. But now we understand that galaxies live, in the sense that there's an interplay of gas and stars," said Thomas Statler, an associate professor of physics and astronomy and lead author of the study, published in the Dec. 20 issue of the Astrophysical Journal. The newly discovered X-ray disk offers more evidence for that argument. Using NASA's Chandra X-ray Observatory, an orbiting spacecraft that houses the most powerful X-ray telescope in existence, the astronomers discovered the disk while analyzing data collected from NGC 1700, a young elliptical galaxy about 160 million light years from Earth. Giant in size and about 8 million degrees in temperature, the disk was an unexpected find for Statler and colleague Brian McNamara. But while its gargantuan scale is striking, the disk also yielded another surprise: The hot gas is not in calm balance with the gravitational forces as expected, but spinning through the galaxy. 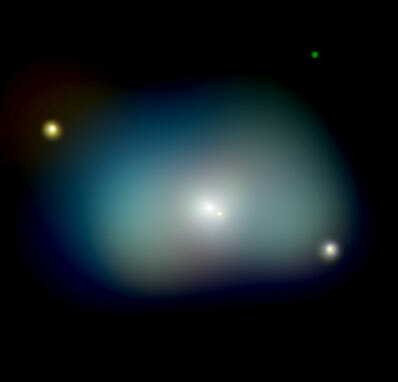 In fact, the giant, rotating X-ray disk suggests that this elliptical galaxy - and perhaps others like it - wasn't created by the merger of two spiral galaxies, the leading picture of elliptical galaxy formation. "If you take the simple picture that everyone has been working with, it really can't explain this," said Statler, whose research is funded by NASA through the Chandra X-ray Observatory Center. The astronomers hypothesize that the X-ray disk was created during the collision of an elliptical galaxy and a spiral galaxy. But instead of crashing head-on, the galaxies first dealt each other a glancing blow, sending the elliptical galaxy's hot gas into a tailspin. "When you see gas spread out in a disk, like we're seeing with NGC 1700, it's telling you that the history of the galaxy is something more complicated," Statler said. The rotation of the X-ray disk also could impact the way astronomers establish the mass of galaxies, Statler added. Scientists calculate mass based on the hot gas found inside, assuming that the gas is in pressure balance with gravitational forces. But rotation of the hot gases may throw off those computations. The researcher's team is beginning to re-examine data from other galaxies to determine if the phenomenon exists elsewhere in the universe, and if scientists should recalculate galaxy weight. "We want to figure out how widespread and how significant the rotation in the gas is," he said. "It could tell us how to correct what we've done before." NEW! The final lunar mission to date, the journey of Apollo 17, occurred 30 years ago this month. The mission is captured in this spectacular six- and two-disc sets. Pre-order today and save! NEW! The December 1968 journey of the Apollo 8 crew into lunar orbit is relived in this unique three-disc DVD set. Pre-order today and save!